Black Dog to me sounds/feels like a Lester (especially the bends), classic Les Paul on the solo & the main riff/verse tracking sounds like transistor/ss distortion of some type, like mixing up line/mic levels patched into a tape machine or something, very lo-fi. Funky ****. I love how a lot of 60's/70's bands, especially Led Zeppelin though, kept experimenting all the time with guitar sounds. I am 100% certain that the solo in BD, whichever guitar, is going through a Leslie rotating speaker. I know that sound like I know my name. IMO though, it sounds twangy like a Tele. The main riff does sound like an LP. That is indeed straight into the board. No guitar amp. They also slammed the front end of a blackface UREI 1176 compressor and triple-tracked it. A surprising amount was straight into the board. Don't know if it's confirmed, but I'd bet you a dime to a donut that "Black Dog" is that Tele. Also the solo in "Down By The Seaside"
Climb down off the hilltop... Get back in the race. What a great project (and teaser), looking forward the full announcement. And wow John, must have been a really special moment to share some time with Jimmy around that project. Official announcement scheduled for Thursday January 24th. $24k for the 1st 50 dragon's , did I read that right ? I was really hoping we would get to see more of the original. Can anyone confirm if some of the video is showing the original? The original got painted over by some "friends" while Page was on tour. Ruined. The neck ended up on the "Botswana Brown" B-Bender Tele. So the story goes, anyway. Yes, it looks like there's about a dozen photos of his stripped 1959 tele towards the beginning of the video. Apparently, they were taken in London while the CS guys were analyzing it. Amazing how one journalist (I think with Musician magazine, IIRC) dubbed Page's Firm-era Tele that, and the name stuck permanently. I've always assumed the brown color was a homage to George Harrison's rosewood Tele. Fender's announcement including prices and expected ship dates. Music Zoo (probably among many) taking pre-orders. Am I buying one? Um ... practicing the art of bad photography at the Orange County Guitar Show Saturday and will decide afterwards if ... oh, who am I kidding? TAKE MY MONEY! GO AHEAD! TAKE IT NOW! Last edited by 4string; 01-24-19 at 04:59 PM. Yes that’s definitely his original shown in the photos at his home. Fully stripped and ready to be repainted! If you study the grain pattern from original Zeppelin and Yardbirds photos you’ll see it’s exactly the same. He finally talked about the mods made on his Supro Coronado, which was repaired and modded after it fell out of the back of his van at an early gig. If you try to do this mod on your own, remember to drive on the LEFT side of the road when you throw your Supro out. It was pointed out to me that if you watch the video you will see on the bottom of Pages "custom wound" bridge pickup, there happens to be a couple of small ceramic magnets as well. Another "cat out the bag" regarding his Tele tone? Last edited by kats; 01-27-19 at 08:23 PM. Interesting indeed. If in fact this was a custom feature of the original bridge pickup used on those early Zep recordings, it would help explain why a lot of people confused its tone for the #1 LP. I think you’re right about Kay, but I’ll bet it’s from Musician magazine in April or May of 1985. I no longer own my stash of Musician magazines from the ‘80s, but I distinctly remember the phrase in the context of The Firm, when Page played the B-Bender Tele extensively. When I saw the prices above, I thought they must be a mistake. How could the mirrored Tele (A basic Tele with circular mirrors stuck to the body) be $1100 more than the Dragon Tele, which is the one everyone would want? Then I got an email from Music Zoo that confirmed the Dragon is $1399 and the Mirrored $2499. Makes no sense whatsoever. What's even more strange is that the photos of the mirrored Tele on Music Zoo have no mirrors on them. I believe that the Dragon is MIM and the Mirror is made in the USA. I remember watching footage of LZ, doing "Dazed and confused" and "How many more times" on a BBC doco when I was a teenager. I believe the performance was for Danish TV. It was black and white footage and I thought the dragon was etched into the body, I thought it looked great. Now that I've seen it in colour - not so much. I do dig that pick guard though. You're probably right, although the video about the "making of" did not specify. Also, I have to assume there will be signed Dragons and that those will be a five-figure price. Man, that ash body looks great. Believe me, it's GW. The Musician Mag from 1988 doesn't get into gear specifics. Just a really cringe-worthy interview with Charles M Young asking terrible questions. We're in complete agreement on the author. He recycled the phrase from his earlier profile of Page for Musician magazine. Last edited by Ed Driscoll; 01-28-19 at 07:22 PM. Those magnets Underneath the bridge pickup are one hell of a major clue! I never thought the tele sounded just like a Les Paul but it sure the hell didn’t sound like a twanging tele either! And that photo of the tele and the sun dragon blows my mind. That is his original telecaster and of course we now know repainted after seeing it completely stripped again in the fender video. As a fan since 1972 I didn’t think I would ever see it again, remember nobody Has seen it in public since 1969 so to see it again tickles me pink! I have some video from NAMM about the Sundragon amp and the Tele. I got info from Fender about the magnets on the back of the bridge pickup. I also talked to the Sundragon amp maker and got to try it. I’ll post the video here once I upload it. Does anyone know what tubes are in the power section? Here is my interview with Mitch Colby about the new Jimmy Page Signature Sundragon amp at NAMM 2019. We saw the amp first day of NAMM and they did not have a Tele there to demo it. But even with humbuckers I thought it had THE Page tone. I was impressed. Matthew and I also give our first impressions of the Fender Jimmy Page Mirrored and Dragon Telecaster. Two interesting details about the Tele bridge pickup shown in the Fender presentation video at the Fender booth are the ceramic magnets on the copper plated steel bridge plate and the fact that the pickup in Jimmy Page's original guitar that they measure, is a grey bottom Tele bridge pickup. Thanks, Jon!! I met you both at NAMM when I was at the Kay booth with Jimmy V, so it was a pleasure spending time with you both. You really nailed everything regarding the Sundragon Amps and the Page guitars. I, too, was quite surprised that on Fender's website they only indicate the Custom Shop Mirrored Tele without the mirrors attached, but I admit I would also prefer it that way. Fender should sell gobs of them, especially the Dragon. I saw Page with The Yardbirds, and that guitar, in '66 and it changed my life!! Mitch is a great guy and a great amp builder and I am sure these amps should do well. Did he give any indication of why Supro was not involved? Good move on his part by doing it on his own. 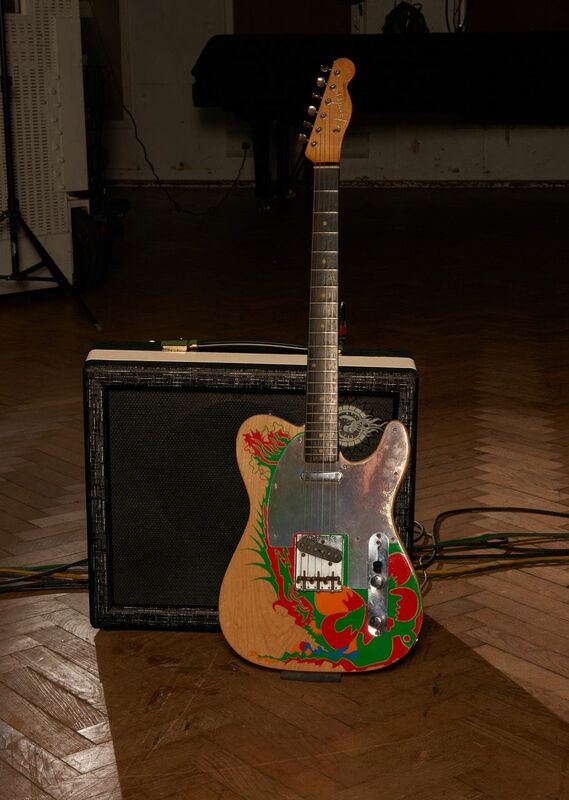 Another interesting thing is that on the signed Dragon Teles Jimmy has changed his signature. It's very different from how he signed the Les Pauls and his photo book, for example. Wonder why? Anybody actually seen one of these in person yet? Non custom shop mirror guitars are supposed to ship in mid-March. Dragon guitars scheduled for mid-July. Help me out here, from what I can tell the Mirror Tele is basically a USA made Pure Vintage '59 Reissue Tele with Jimmy's name and some mirrors in the case? IIRC, I don't remember a non-custom shop '59 reissue being made yet but that's what it looks like from a distance, if so...pretty damn cool in and of itself. Jon, Great video and review.